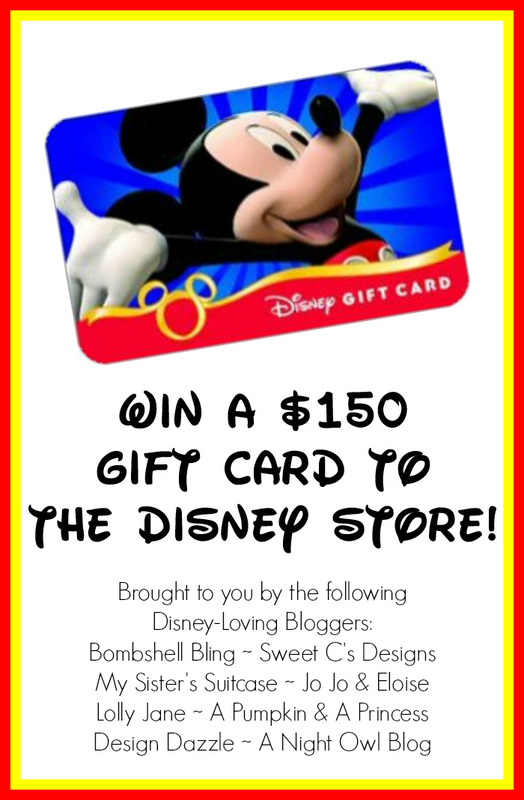 You are here: Home / giveaways / Disney, Disney, Disney and $150 Disney Gift Card Giveaway! 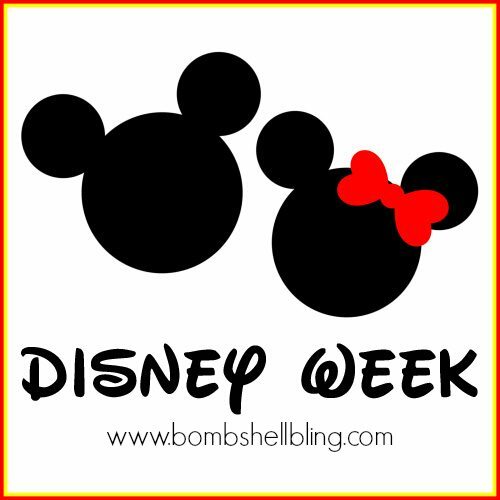 My friend Sarah from Bombshell Bling, is celebrating all things DISNEY this week. Not only is Design Dazzle sharing some awesome Disney ideas with you but get ready for TWO Disney themed posts a day on Bombshell Bling! We also are sharing this AWESOME Disney store giveaway (enter below). Check back for an all-Disney link party (going live March 8th at 6am EST)! It’s Disney, Disney, Disney!! How awesome! You can enter below for a chance to win. Good luck!!! Everything about Disney makes me feel like a kid again. Even when I’m watching older movies with my young son, I can’t help but feel like the six-year old who sat and stared at the tv intently, singing each tune. Disney movies are the best! I am taking my 3 boys to Disney this summer and I think I’m more excited than they are!! Trying to enter. Don’t think I did the first part right. Clicked link “a Rafflecopter giveaway” and says to leave a comment but no where to leave comment so I’m doing it here. My favorite thing is that there is a thing for everyone 🙂 Like Mulan the warrior princess or Belle the brainy beauty or Stitch the awesome alien, there is always a character for someone to fall in love with. Yes, you did it correct Chantelle! Thanks for entering. I love how Disney can turn anyone anywhere back into a child either just themselves or through the eyes of their children! It’s awesome how going to Disneyland gives us the power to be a kid again! It’s hard to pick one favorite thing about the Disney universe, so I’d have to go with the magic. The wonder and magic of everything Disney does is wonderful. So agree about the magic of everything Disney does! My family has a great time together and has made some great memories while at Disneyland. It’s a place to create wonderful memories! we were able to go shortly after Harry Potter world opened. LOVED, LOVED it!! Disney movies were a major part of my childhood. From winnie the pooh, to the classic movies, and animated pictures. I’ve never been to Disney land or world. But I’m as big as a fan as the next Disney fanatic. I’m taking my three children to disneyland on the fall (including my two month old baby girl). Would love to get them disney ready with this gift card! Love Disney especially the characters dressed to perfection. I always love seeing the Disney characters too! I can just see the joy on my grandkids face if i won this, they would go crazy, love your web site, and love this drawing, hope i win. Disney is just fun! The characters are mostly endearing. Little girls pretend to be princesses. But most of all, it brings back such wonderful memories from when as children we would wait anxiously for the Sunday night Wonderful World of Disney movie! No matter what we’re going through in life, Disney has always found a way to bring out the best in our family. Everyone gets together, smiles all the time and always has fun. Whether it’s Disney family movie nights, going shopping at the Disney Store, planning Disney Birthday parties or going to Disney World. Disney seems to bring us together. I love everything about Disney! The childhood memories, the colors, the music! I love everything Disney. They have some of the best movies and characters. I took my kids to Disneyland for the first time last year and they loved it. I can’t wait to take my kids to Disney next January. I am most looking forward to the look on their faces when they meet their favorite characters!